In memory of my sweet Sophie. One year ago yesterday I had to take Sophie to the vet and let her go. Having to say goodbye to your loved one is always torturous and painful. I am crying as I write this post. I miss my Sophie. 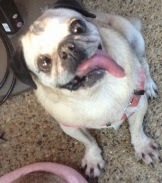 Sophie came to me through DFW Pug Rescue. I volunteered several years ago to be a foster. I am glad to care for dogs that have special needs. I will foster the hospice dogs so they can have someone love them, care for them and won’t be alone in their final days. Fostering hospice dogs is both wonderful and painful. It is a pleasure to have these dogs in my life. To be able to love and be loved by them. They have been abandoned and deserve better. The pain of losing your cherished family member is the most difficult thing you can go through. But I foster anyway because these dogs are all worthy of love and compassion and care. Sophie was what we call a ‘foster failure’. Sometimes rescue groups must make difficult decisions concerning where money is best spent. So I adopted Sophie. Sophie had so many challenges. She was missing an eye, she had a club foot and luxating patellas. 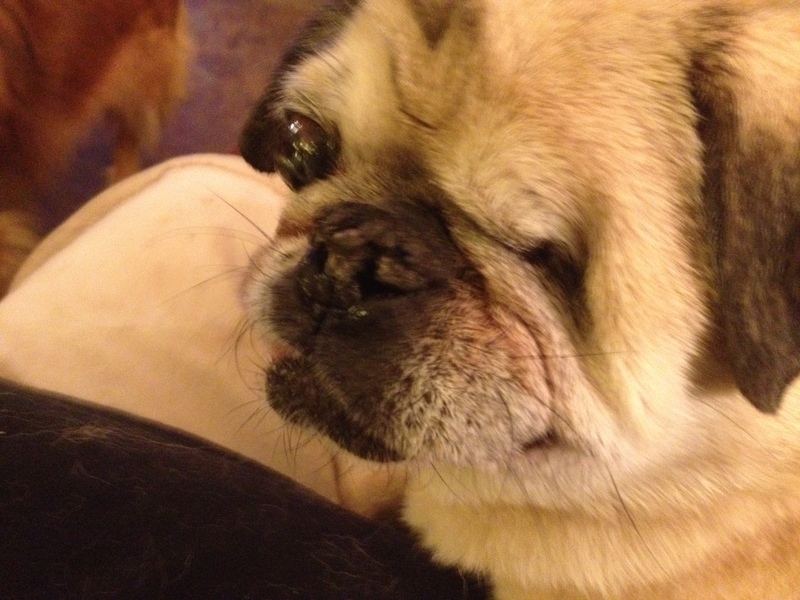 She didn’t have any teeth and shortly after she came to my home she had to had eye flap surgery for an eye ulcer. Sophie was a trooper. She was joyful and loving. When she got excited she would spin in circles because her club foot acted like a paddle. Through all these challenges she was sweet, loving, accepting and carried on. Sophie didn’t think she was a hospice dog or a special needs dog. She was with me for almost three years. Then Sophie started limping, keeping weight off her one good leg. I looked for stickers and bites, she didn’t respond to me feeling her leg. So off to the vet. After exams and an x-ray he said she had a fracture at her shoulder joint. Next we went to a surgery specialist. The specialist did not have good news. Sophie had a cancer in her lungs and bones. This was inoperable. Her pain was increasing at a fast rate. So I took Sophie home with pain pills and kept her as comfortable as possible. It is difficult to make the choice that ‘now’ is the time to let the dog die, euthanasia. I knew I had to let Soph go when she would take her cheese covered pain pill. I put it in her mouth a said please. I could see her struggle to swallow for me. Still being the wonderful girl. I wish my dogs could tell me, “I’m ready now, please let me go.” But the burden is mine as their caregiver. They are my family and my responsibility. In memory of Sophie, I started this blog to share the joys of animals, the emotional life of animals and to bring light to animal rights and causes. And To Honor Sophie and all the dogs I have loved and lost. I started my blog because I missed my cat a lot. You have been a great owner & Sophie is somewhere missing you. Be happy! Thank you for stopping by, I appreciate your kind thoughts. I will follow your blog. Sophie was so lucky to have you to love and care for her. It’s very hard when a dog is so ill – I fostered 4 hospice dogs last year – but what a gift they are. Thinking of you on this bittersweet anniversary. Thank you. I was fortunate to have Sophie. You are right they are a gift. I agree that it’s the hardest part- the knowing when it’s time. I’m sorry for your loss. I’ve been there, so I know how it hurts for a long time. I do honor to all my loved dogs that are gone by continuing to love and the dogs in my life now and the future. Knowing I will grieve is not a reason love and care for another life in need.